When choosing which folder to use for my holidays, the main factors which count are the needs for portability, the amount and type of riding planned, and luggage capacity. The importance of each factor can vary depending on the type of holiday, and thus the chosen machine will change as well. I'd never been to the Lake District before my week there at the end of June 2002, and like my trip to Skye a couple of months earlier, this was primarily to be a photographic holiday, based at Lakeland Photographic Holidays in Braithwaite. The format of their holidays involves daily trips out from their base, travelling as a group on three days, and the other three days being left to individuals to make their own plans, with plenty of suggested places to visit. Therefore I wasn't planning a large amount of cycling - just to the station at this end, then by train to Windermere, and then cycle from there to Braithwaite, repeating the process in reverse for the return journey, plus perhaps a few fairly short rides while there. 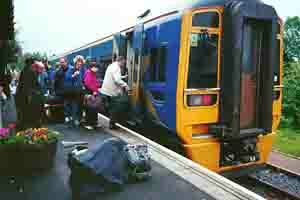 In order to get on trains easily, and avoid the need to book before hand, portability was quite important. However. the most important factor in choosing which bike to use was luggage capacity. As in the case for the Skye visit, I intended to take a medium format camera, and in view of its size and weight, and the need to do quite a lot of walking, a backpack would be the most convenient form of bag for the camera, and this needed to be carried on the bike - certainly not on my back while cycling. Although in the end I did not take the medium format gear and backpack to Skye, this time I stuck to my original intention, and in both cases this was a crucial feature in choosing which bike to use. Although the total quantity of luggage involved is not particularly large, the size and shape of the back pack makes it difficult to stow on most bikes, whether they are folders or not; the Moulton rear rack is ideal, but the lack of portability ruled out a Moulton. The choice therefore came down to which Brompton to use, as their luggage carriers are the only ones which will conveniently accommodate a back pack - slipping the normal bag off its chassis, and strapping the backpack onto the chassis instead. For Skye, the original plan had been to use a large backpack on the front carrier of the T6, using some of the space for clothes and other non-photographic gear, and using the rear rack-top bag to carry the remainder, with a tripod strapped on top. 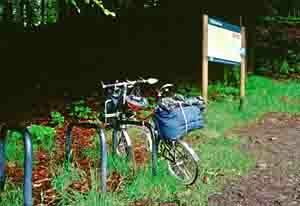 When the medium format system was abandoned in favour of 35mm and digital, the large Brompton Touring Bag was used at the front to carry everything except the tripod, which was strapped to the rear carrier. Although the T6 performed well in Skye, the slightly high gearing (even with the reduced gear option) and gear range made it less than ideal, and had it not been for my wish to do more testing of the bike at the time, I would probably have chosen the Brompton SP instead. This time, with no duty to do more testing, I opted for the SP, my main worry being the fact that I would not be able to use anything other than a Primo tyre on the back, due to the limited mudguard clearance. For heavier use, possible off road riding (not planned, but you never know), grip and durability, I would prefer to use Schwalbes, even though the Primo certainly provides the lowest rolling resistance. My SP also has an SP rear rack, which allows the Brompton mounting/bags to be fitted both front and rear, so the front rack (minus bag) was used to carry the back pack and cameras, while the rear rack carried a standard Brompton front bag (if you see what I mean!) plus tripod. Fitting everything in was quite a tight fit, although as I was using quite a small photo back pack, and only the standard Brompton bag, not the touring model, it would certainly have been possible to get a lot more on the bike. However, with a total front load of 16 pounds and a rear load of 19 pounds, I did not want any additional weight to carry, either when riding or when getting on and off trains. Incidentally, the weights are quoted in pounds as usual as they were measured on some not very accurate bathroom scales - I would not place too much reliance on their absolute accuracy. Using the Brompton meant that fitting and removing luggage was quite quick and easy, though in the case of the rear SP carrier, an additional mounting has also to be removed, which is a bit fiddly. Carrying the luggage is also quite easy when off the bike, due to the handle provided on the Brompton carriers, and I could just manage to carry the bike in one hand and the luggage in the other hand when boarding the train, or changing platforms. 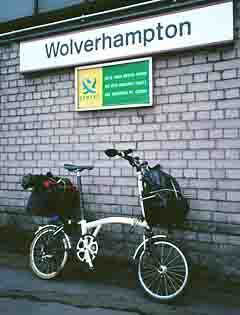 I don't need to fold to travel from Tipton to Wolverhampton, and it is easier to move the bike from the bay to the departure platform while it is still unfolded. The camera bag (Lowepro Micro Trekker 200) is bungeed on to the front rack, and covered by a plastic sack in anticipation of rain. 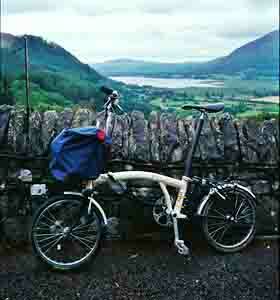 The standard Brompton bag is mounted on the SP rear carrier, with the tripod bungeed on the top. I set out on 22 June, riding to Tipton, catching a train from there to Wolverhampton, and then boarding a train to Oxenholme. Regrettably this train was one of the new Voyagers, with very limited luggage capacity, though this early in the morning it did not present any problems as it was relatively empty. By the time we got to Oxenholme we were about 15 minutes late, but I just managed to make the connection for Windermere. Changing trains at Oxenholme. The SP is covered with an A to B cover, and the two bags are on the right. By the time I disembarked, the weather was looking quite threatening, and it was with some trepidation that I set out on the ride over to Braithwaite. I'd originally intended this to be quite a leisurely ride, stopping frequently to take photographs, or explore side roads if they looked attractive. However, in view of the weather, I decided to head direct to Braithwaite, although not at any great speed in view of the load I was carrying. Most of the ride was along the A591 - a fair amount of traffic, but bearable. Although the ride could certainly not be described as flat, the hills were less of a problem than I had feared, and I managed to get up them all without walking, though I did spend quite a bit of time grinding (figuratively!) along in bottom gear. There were some good descents as well, with the V-brakes of the SP providing plenty of stopping power, though the Primo at the back can lock very easily, requiring some caution. To get away from the main road, I diverted around Thirlmere via a small side road, which was the point at which the threatened rain materialised. Fortunately the trees provided some shelter, and by the time I rejoined the main road, the rain had eased. However, the conditions prompted me to stop in Keswick and purchase some new boots (the ones I was wearing were the only footwear I had with me, and they are not longer very good at keeping out water) and some overtrousers (I dislike cycling in these, and I did not have any with me). A brief stop on the side road around Thirlmere - the parking spot is even provided with bike racks! As I had not made the planned stops, I arrived at Braithwaite very early, and after unloading my luggage, I went for an additional ride round Bassenthwaite Lake, keeping an eye open for the Ospreys which are nesting nearby. The ride along the western side, on the A66, was marred by the traffic, though it was still quite pleasant, but the return along the eastern side was much more pleasant, except that a mysterious creaking and squeaking noise appeared, mainly, but not exclusively, when pedalling under load up hills, and which I was not able to trace. I did pass an Osprey viewing point, but decided not to climb the hill to get to it. Back at Braithwaite I investigated the noise, but couldn't find any explanation, and settled for doing some general lubrication. Most of the time during the week was spent on photography, walking and/or using a Land Rover to reach the locations, but on one day I did take a short ride through Whinlatter Pass, up towards Cockermouth and then back along the western side of Bassenthwaite Lake. The climb up to the pass from Braithwaite was challenging, even with reduced luggage, and I have to admit that I pushed for about 50 metres. Although the mechanical noises still seemed to be present intermittently, they were getting now worse, and although I couldn't identify the source, my suspicions centred on the rubber suspension block mounting and the plastic end cap which rubs on the seat tube - irritating, but not critical. The only other occasion during the week when I used the bike was on our outing to Watendlath - we went up there in the Land Rover, but I took the SP in the back, folded up. After a fairly strenuous walk to Dock Tarn and back, the SP was unloaded and I rode back, making a circuit of Derwent Water in the process. The steep descent from Watendlath was a good test of the V-brakes, which performed admirably, though the ease with which the rear wheel could be locked encouraged a cautious approach. A view of Bassenthwaite Lake during the climb to Whinlater Pass. The bike is now relatively lightly loaded, with a digital camera and tripod (and lunch) in the standard Brompton bag, now transferred to the front. Taking a break later the same day - Murphy's Law came into effect, while preparing to take the picture, the Post Office van arrived to empty the box, so I had to move the bike. All too soon the holiday was at an end, and the bike had to be loaded again with luggage for the return journey on 29th June. I was not looking forward to the hill out of Keswick, and it did reduce me to walking for about 50 metres, but otherwise I managed to ride all the rest of the hills. Somehow I missed the side road around Thirlmere, so this time I stayed on the main road all the way. 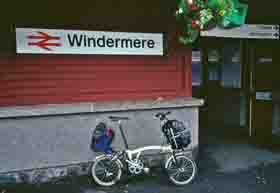 Unfortunately just before Windermere I had a puncture. I'd been a bit concerned about using a Primo on the rear, but my puncture was actually in the Brompton (Kevlar version) front tyre, caused by glass. Repairing it was fairly easy, and the advantage of the easily removed luggage system of the Brompton was demonstrated again. The rest of the return journey was relatively uneventful, though on a much fuller Voyager there was no luggage space left, and I spent the entire journey standing in the lobby with the SP and luggage. The train from Wolverhampton to Tipton turned out to be even less pleasant - there were plenty of seats, but a gang of yobs decided that a lone cyclist was a good target, and made it a miserable experience. Overall, this was a most enjoyable week, and, despite poor weather on the way up there and for the first day, things improved, and the conditions were quite good. 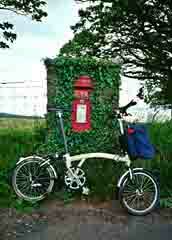 The Brompton SP proved admirably suited to this type of holiday - portability was great, luggage capacity quite adequate, and the riding qualities were more than adequate. Apart from the occasional mechanical noises and the punctures, there were no problems, and a bit of attention to the rear suspension block now seems to have eliminated the problem. The lighter weight of the SP, with the improved brakes and gearing, certainly made for more enjoyable riding than when I used the T6 on Skye, but that's not intended as a serious criticism of the T6. I would have liked the number and range of gears of some of my other folders, but the portability and luggage capacity advantages of the Brompton SP certainly made it the right choice for me on this occasion. Finally, if you are looking for a good photographic holiday, I can certainly recommend Lakeland Photographic Holidays - the trouble is, they are so good that they are already fully booked up for the remainder of 2002!